Daddy Shahid Kapoor and Daughter Misha Kapoor share a cute moment together! Clearly, Misha Kapoor is her Daddy Shahid Kapoor and Mommy Mira Rajput Kapoor‘s entire world! The parents are often seen showering affection on their little girl. Be it during their public appearances or in Instagram uploads. Two things are obvious, one that Misha is very loved, second that the little girl has a lot of fun with her parents! Mira Rajput Kapoor recently shared an Instagram boomerang video of Shahid and Misha. Boy, do they look adorable or what! 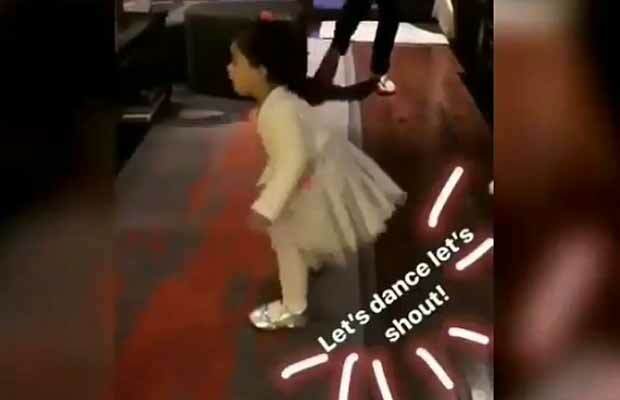 While we are familiar with Shahid’s stellar dancing skills, this was the first time we saw his little girl show off her cool dance moves! In the short clip, we can see the daddy-daughter duo shaking a leg to a dance number. Well, Shahid is shaking his legs and Misha is moving her entire body! In the said video, Shahid is in an all-black outfit. He is sporting a black full sleeved tee while his little girl is in a little white dress! Misha also has cute hair clips adorning her hair. On the work front, Shahid Kapoor, Deepika Padukone and Ranveer Singh starrer ‘Padmavati’ has been delayed from its December 1, 2017, release. The new release date has not been announced yet. Next, we will see Shahid Kapoor in Shree Narayan Singh’s ‘Batti Gul Meter Chalu’. The movie is expected to release on August 31, 2018. Previous articleFemale Cricketer Danielle Wyatt Who Once Proposed Virat Kohli, Now Reacts On His Marriage With Anushka Sharma! Next articleAnushka Sharma And Virat Kohli All Set To Still The Thunder From Salman Khan’s Tiger Zinda Hai?